What first struck us was the very active circulation of books in print, compared with digital versions which do not spread so well. Once a book has been sold either in a bookshop or through an online platform, it has multiple lives. It can be loaned, given as a present, but also sold on second-hand, online or in specialist shops. And it can go full circle and be resold, such journeys made in a book’s life are rarely taken into account by the overall evaluation of the publication. The application Bookcrossing allows you to follow books that we “abandon” or “set free” by chance in public places so that strangers take possession of and, then, you hope, get in touch to keep track of the book’s journey. Elsewhere, the book will be left in an open-access “book box” which have popped up across France and other countries. Some websites have become experts in selling second-hand books like Recyclivre, which uses Amazon to gain visibility. Yard sales, antiques fairs, book markets give a new lease of life to countless books which remained forgotten because they were a quick one-time read. The book as a material object, regardless of its age, retains an unequalled sensorial pleasure, and brings with it special memories, bygone times, a sacred piece of craftsmanship with its fragile bindings, or, the nostalgia offered by children’s books or fairy tales. Whole professions are dedicated to the web, and increasingly so, since it first came into existence. This has turned the second life of books and the recycling of them into a money-making machine for online retailers, and as a result books are kept alive. Some people have become eBay sellers, experts only thanks to the books they sell on this platform. Sometimes even, these books’ lives are extended by charity shops, such as Oxfam. At some stage however, there is only the paper left to give a book its value, once it has been battered and recycled. One would have thought that faced with the weight, volume, and physical space occupied by books in print, that the digital book ought to have wiped the floor with its print counterpart. This has been the case with online music, for example, which practically handed a death sentence to the CD, or for films on demand which have greatly shrunk the DVD market. However, for books, this simply has not happened. 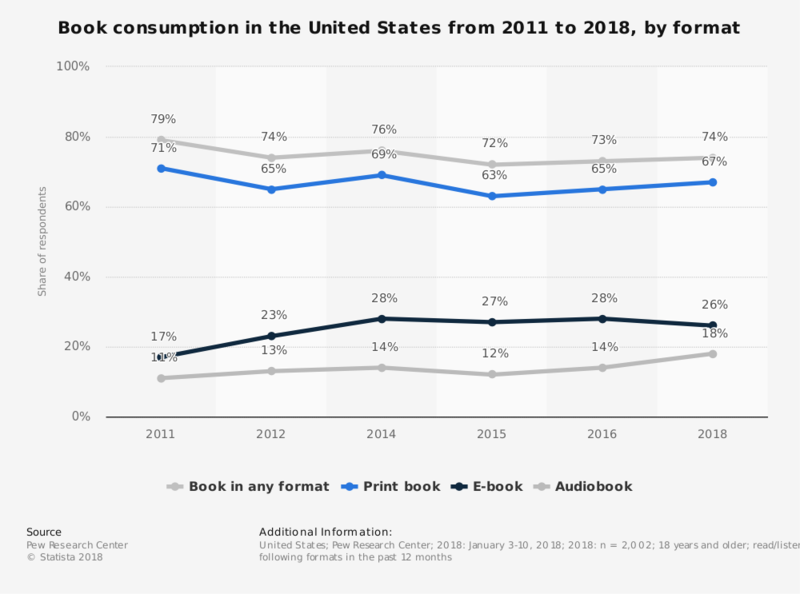 In the United States like in France, the market for online books never surpasses the 20% mark of the sales revenues of books in print. And that is without including the sales revenue of the second-hand book market as we previously mentioned. The digital book seldom goes anywhere once purchased, due to controls imposed on the files by digital-rights management (DRM) and the incompatibility of their formats on other digital devices (Kindle and others). Our interviews revealed the pleasure of giving books as presents, but also of lending them. The exchange of the physical item with its cover, size and unique smell bring much more satisfaction than if a well-meaning friend offers you digital book files on a USB stick containing… a thousand files already downloaded! Indeed, the latter will seldom ever be considered a present but rather a simple file transfer, equivalent to what we do several times a day at work. This also gives rights holders reasons to thus decry “not paying is theft”, in this case the gift of files would also become theft. Bloggers who exchange books as presents (bookswapping) show that goodwill prevails and puts stress on the backburner. This is done on the condition that the book is personalised in some way: a poignant quote, a meaningful object associated in some way with the book (cakes for example! ), and the surprise of receiving a completely random gesture of kindness. What travels even better than books are conversations, opinions, critiques, recommendations. Some discussions are created within or around reading groups or in dedicated forums online such as the Orange Network Library, for example. There are recommended reading lists, readers’ ratings, and book signings with authors are organised. These networks are digital, but they existed well before the Internet, and they remain dynamic today. 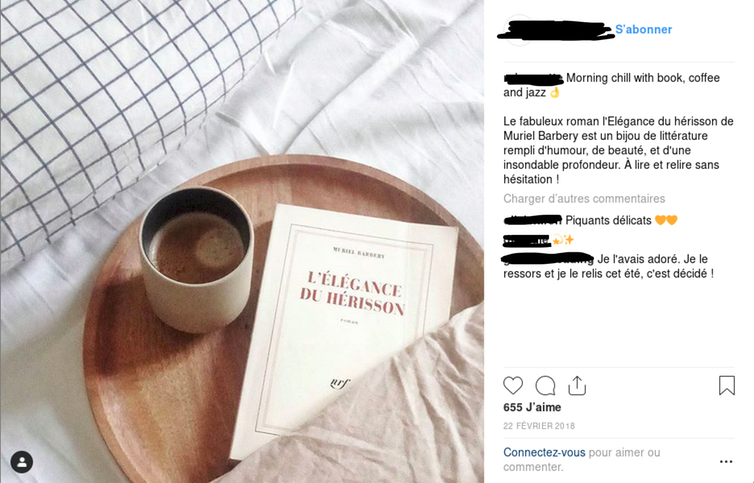 On Instagram and other sites, books start up fresh conversations. However, the rise of blogs at the start of the 2000s led to an increase in the number of reviews by ordinary people. This provided visibility, even a reputation for some bloggers. Of course, institutional and newsworthy reviews continue to play their role in guiding the masses, and they are influential prescribers protected by publishers. But websites like Babelio, combine a popular expertise, shared and distributed among many bloggers who are sometimes very specialised themselves. The website was created in 2007 and has over 690,000 reader members. The proliferation of content and publications can easily disorientate us; the role of these passionate bloggers, who are often experts in given literary fields, becomes important because they are “natural” influencers one might say, as they are the closest to the public. However, some publishers have understood the benefits of working with these bloggers, especially in so far as concerns specialist genres like manga, comics, crime novels or youth fiction. Sometimes a blogger, YouTuber and web writer is published like Nine Gorman. Some bookshops contribute even more directly in coordinating these bookworms, they “mould” their audience, or at least they support the books both online and in their shops with face-to-face meetings. Conversation is a unifying force for fans who are undoubtedly the best broadcasters across a broad sphere. Platforms encourage readers to expand their domain, in the guise of fanfictions, which are published online by the author or his readers. The relationship with authors is closer than ever and is much more direct, the same can be said of the music industry. On particular platforms like Wattpad, texts which are made available are linked with collective commentary. But above all, the dialogue about reading has often been transformed into writing itself. It might be published on a blog and may be likened to authorial work but at the other end of the spectrum, it might be something modest like the annotations one leaves in their own book. These annotations, more common in non-fiction texts, can form a sort of trade. For example if you lend or sell on a book, which is also stocked and shared with the online systems of Hypothes.is, it allows any article found on the web to be annotated, and the comments saved independent to the display format of the article. This makes it easier to organise readers into groups. Printed books have in fact become digital through the use of digital platforms which allow them to be circulated as an object or as conversations about the book. The collective attention paid creates a permanent and collaborative piece of work, very different to frenetic posts on social media. Readers take their time to read, a different type of engagement altogether to social media’s high frequency, rapid exchanges. The combination of these differently paced interactions can, though, encourage one just to read through alerts from social media posts then followed by a longer form of reading. Networks formed by books constitute as well a major resource for attracting attention. This is still not a substitute for the effects of “prize season” which guides the mass readership, but which deserves to be considered more critically, given the fact that publishers increasingly take advantage of these active communities. It would thus be possible to think of the digital book as part of the related book ecosystem, rather than treating it as just a clone. To call it homothetic, is to say that it is an exact recreation of the format and properties of the book in print in a digital format. Let’s imagine multimedia books connected to, and permanently engaged with, the dialogue surrounding the book – this would be something else entirely, affording added value which would justify the current retail price for simple files. This would therefore be an “access book” and which would perhaps attract a brand new audience and above all it would widen this collective creativity already present around books in print.